If something is criticized for being untrue to the facts, Aristotle tells us you can support a work by arguing that it's an idealized take on the facts - like how characters on The West Wing talk the way people ought to talk. The same argument that allows fictional characters to act unlike real people can be used to forgive fictional characters for acting unlike the versions of them portrayed in seminal works. "Professor X talks that way in the game," a developer might say, "because he's supposed to have lived in New England all this time, and we decided he picked up the accent." You don't have to like it, but Aristotle says it's fair game. Even if your user-created content doesn't jive with the facts put forth in seminal works or present some idealized view of the characters, that's all right. Aristotle says it's OK, as long as your work reflects popular consensus. In other words, it doesn't matter that Wesley Crusher didn't actually save the Enterprise every week, you can still mock him in your work for doing that because, you know, that's what people say. Got a problem with that? 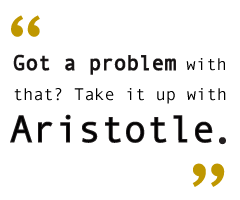 Take it up with Aristotle. The signal-to-noise friction created when virtual worlds rub up against each other creates a cognitive dissonance in the audience. It's stimulating. It's conflict, and conflict is compelling. It prompts debate (or, on the internet, screeds and flame wars). It's a mental exercise, like a puzzle in which not all of the pieces fit and a thousand different pictures can be assembled from the same box of bits. When virtual worlds and prosumer content become big enough, they'll go meta, and we'll know a given subculture has matured when it is subject to culture jamming. Once some marketing campaign's virtual world gets subvertised, it can be sure it has arrived in the pop consciousness through pop consensus. At that point, enough people will be tapped into that virtual world that commentary on it and reaction to it in the real world can constitute art of its own. The virtual world might, at that point, reach a degree of popular consensus that a revolution occurs, and the creators of the seminal work can no longer declare or decide official canon. The mass of the public notion outweighs the authority of the creator, and the virtual world explodes into its own star. It now provokes and inspires derivative art of its own, a fan series based on a fan series or fan fiction that boldly deviates from the facts put forth by other, popularly accepted fan fiction. How long before a company's viral marketing campaign spreads along live vectors so far outside the company's reach that it can no longer be controlled? The uncertain notions of what canon is are like nebulas, and eventually the forces of popular consensus will compress some marketing campaign's stellar gases into a volatile mass, sparking a new star that outshines the original. Some fan-produced spin-off will outsell the original. That virtual world - rendered only in the like minds of consensual fans - will be as real as any MMOG; it just won't look exactly the same to all inhabitants, and it'll be stored in the popular consciousness. Asteroids orbiting moons orbiting planets orbiting stars spinning around the axis of an idea in a virtual, expanding universe.